Rules will Open Up Some Commercial Drone Applications, but Packaged Deliveries Clearly would not be Allowed; Amazon to take Research to Other Countries? 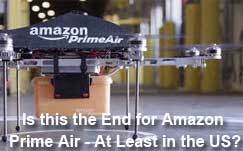 Amazon Prime Air, the on-line giant's planned drone-based delivery service, may now have to be mothballed as proposed new Federal rules for commercial drones simply wouldn't allow a product delivery model. That would be true for others that had ideas for such a service, such as a florist in Michigan and a micro-brewery in Wisconsin, as the rules really preclude drone deliveries for anything. At a conference in December, Amazon CEO Jeff Bezos commented that when it comes to drone deliveries, "Technology is not going to be the long pole. The long pole is going to be regulatory." The Federal Aviation Administration (FAA) released its proposed new rules over the weekend, which will now go through a long period of pubic commentary and debate before eventually being adopted as official rules. There is some chance of course the rules could be changed based on that process, and they are unlikely to go into effect until at least 2017. However, since in general the FAA has not allowed commercial drones to operate before these new rules, it's not like companies such as Amazon can experiment with drones until then. • They can fly at a maximum speed of 100 mph and cannot be flown at an altitude of more than 500 feet above the ground. With special Air Traffic Control clearance drones can be flown at altitudes between 500 feet and 18,000 feet. • The drone must remain in the line of sight of the operator at all times and has to be flown during the daytime. This line-of-sight requirement is the one that effectively bans drone-based deliveries. • A camera - though not required - may be attached to the drone to allow for closer flight observation by the operator. • The operator of the drone must be at least 17 years old and must have passed an "aeronautical knowledge test" and be vetted by the Transportation Security Administration. • Drones cannot be flown at night and operators are not allowed to be in control of more than one drone at a time. • While in flight, a drone cannot be operated over people "not directly involved in the operation." The requirement for direct one-on-one control by an operator, and the ban on flying drones over people not involved in the operation itself, both would also seem to put a kibosh on commercial drone deliveries. While killing Amazon Prime Air and other drone product deliveries, experts say there rules - which remain vague in a number of areas - nevertheless would make it easier for people like real estate agents, aerial photographers, videographers, police departments and farmers to fly small drones for work purposes as long as they have a permit. But whether a videographer, for example, could fly a drone with a camera above an outdoor wedding is not clear. "The FAA's proposed rules for small UAS could take one or two years to be adopted and, based on the proposal, even then those rules wouldn't allow Prime Air to operate in the United States," said Paul Misener, Amazon's vice president of Global Public Policy. That latter comment may be referring to rules in other countries such as India or the United Kingdom that may be more accommodating to drone technology. Bezos has said Amazon may be forced to move its center for drone research to one of these other markets from the US if the rules here are going to block use of the technology. Some US lawmakers have suggested Congressional legislation might be needed to create a more flexible rule set for drone deliveries and other applications that would not be permitted under these FAA rules. Are you pleased or unhappy with these new drone rules that will ban delivery operations? Let us know your thoughts at the Feedback button (email) or section (web form) below. Drone commercial delivery flights are not doomed, but certainly postponed for some time in the US as they should be. Sure the idea to have your "book" flown to you in 30 mins seems to be "some" consumer demands, but I believe more review needs to be done to ensure all issues are considered. I for one do NOT want to hear a drone "buzzing" my house making a late night pizza delivery for the guy next door. This rush to deliver reminds me of all of the Uber car service issues that have arisen across the globe as they have just seem to have disregard local laws to provide a service. We may not like government delays, but it is needed in our "business rules all drives all decisions". Heck, I would be happy if just as many organizations and people put as much energy in prompting our government to pass a transportation bill. Where is businesses sense of priorities? For me, drone deliveries can take a back seat to many other challenges facing supply chain executives. I can see the need for these regulations - I assume the TSA and FAA are trying to pre-empt a bomb-laden drone from smashing into things, but I would think with the right control systems in place, these risks can be mitigated. As for the actual usefulness of drone delivery in terms of SCM, it seems to me like it would only be useful in very niche, responsiveness-heavy industries, like food delivery. Current tech drones have huge drawbacks, like low battery life, limited range, etc. It seems to me it only makes it useful for limited-life perishables like food.